This is the third major recording project from Barry Douglas within a relatively short period. He has now recorded the complete piano works of Brahms and is currently in the process of recording the complete works of Schubert. This new project will pair the major solo piano works of Tchaikovsky with those of other Russian composers. This recording features the two most important sets of piano miniatures to emerge from 19th century Russia (both works date from the mid-1870s). 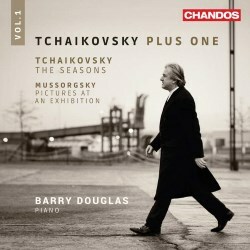 Mussorgsky’s Pictures at an Exhibition is a work with which Douglas has become closely associated; his performance helped propel him to the Gold Medal in the 1986 Tchaikovsky International Piano Competition. This is his second recording of the work. Tchaikovsky wrote Les Saisons in response to a commission from the St Petersburg Music Magazine ‘Nouvellist’. Each of the twelve short pieces depict a month of the year, and each has a title and a short poetic epigraph. This performance by Douglas, one of the best I have heard, stands alongside the greatest recordings of the work. He paints in bold primary colours, bringing each of the short vignettes vividly to life. Janvier (At the Fireside) fuses Schumannesque intimacy and whimsy. This is immediately followed by Février’s boisterous Carnival. Douglas evokes a sense of wonder with his arpeggios as we survey the starlit night of Mai. Juin’s Barcarolle, a justly famous piece, receives a ravishing, highly poetic performance here. Douglas shows his impressive virtuoso credentials in Août while Octobre’s Autumn song is infused with sombre melancholy. Novembre’s Troika was often played as an encore piece by Rachmaninov. Douglas captures the Russian soul of the music and brings a wonderful sense of bracing exhilaration to the final section. Décembre’s waltz is played with a cultivated elegance, bringing the set to its winning conclusion. Mussorgsky’s piece depicts a tour of an exhibition showing paintings by the composer’s friend, Viktor Hartmann. The ten paintings in the suite are linked by a Promenade theme which changes in response to the paintings. Douglas’s handling of the changing Promenade theme is particularly good. He opens the work with a highly resonant rendition of the theme depicting the chiming of bells. The portrait of The Gnome with his crooked legs is exceptionally fine; the character grows in malevolence as the movement progresses. The children’s quarrel in Tuileries is played with a disarming charm and innocence, while in Bydlo one can sense the heaviness of the cart with its enormous wheels lumbering through the fields. I love the sense of whimsy and the lightness of touch which Douglas brings to the Ballet of the Unhatched Chicks. The portraits of Samuel Goldenberg and Schmuyle are characterised brilliantly; the right-hand tremolos underline the pitiful plight of the latter. The toccata figurations of the market at Limoges are well executed, although I would have liked to hear more of the women’s squabbles. Baba Yaga is conjured up in all her black malevolence, I would wish for more of the ferocity and vehemence of the character. The final Great Gate of Kiev is depicted in all its grandeur. The bells ring euphoniously, bringing the work to its glorious conclusion. I have no doubt that this is a superb recording of Pictures, and an improvement on Douglas’s earlier recording. For my money, Richter still leads the field but Douglas finds his own way with the work. This performance is worthy of standing alongside that of the great Russian maestro.